Not much change in routes, according to most observers so far, in the maps Sabal Trail Transmission LLC filed with FERC 2 April 2014. 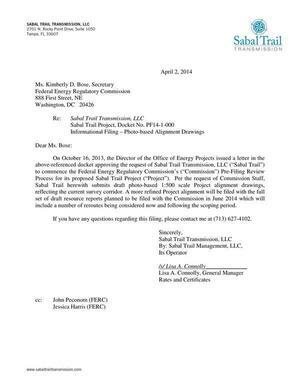 On October 16, 2013, the Director of the Office of Energy Projects issued a letter in the above-referenced docket approving the request of Sabal Trail Transmission, LLC (“Sabal Trail”) to commence the Federal Energy Regulatory Commission’s (“Commission”) Pre-Filing Review Process for its proposed Sabal Trail Project (“Project”). Per the request of Commission Staff, Sabal Trail herewith submits draft photo-based 1:500 scale Project alignment drawings, reflecting the current survey corridor. A more refined Project alignment will be filed with the full set of draft resource reports planned to be filed with the Commission in June 2014 which will include a number of reroutes being considered now and following the scoping period. She copied John Peconom and Jessica Harris of FERC. This is a very large query. The download will take longer than the usual time. Only Sabal Trail filed alignment maps Wednesday.